"Kimchi Prevents SARS in Korea"
It's been less than a year since SARS, severe acute respiratory syndrome, began to sweep away Asian region, particularly China and Hong Kong, and became everyday vocabulary. What SARS has left is severe indeed. More than 3,000 people all around the world were infected with the epidemic disease, and almost 200 of them have died. 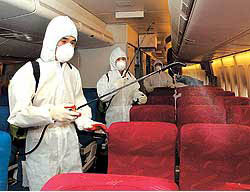 Since most of the SARS patients were from Asia, many people thought Korea could never be free from the impact of SARS. Despite the worries, however, there has been no officially known SARS patient here in Korea yet. Many would wonder what is keeping SARS from taking over Korea. And Kimchi could be an answer. Kimchi, a pickled cabbage seasoned with garlic, red pepper, and ginger, is a traditional staple in Korea. Kimchi has recently broadened its boundary to other Asian countries, such as Japan. Even in Western countries, Kimchi has become fairly popular by now. As SARS failed to penetrate Korea, some efforts to draw out the reason from Kimchi have been made. The studies about Kimchi's preventive effects on SARS have become so compelling that LA Times once ran a feature story about Kimchi and how it prevents SARS. Dr. Hong Chong-hoon of Rural Development Administration in Korea speaks confidently of how Kimchi can scientifically prevent SARS. "A chemical compound called allicin in garlic is key to preventing SARS. When allin reacts to allinase, allicin is produced," said Dr. Hong, "Allicin not only gives garlic its characteristic strong odor, but also produces anti-biotic chemicals, which is thought to help to prevent SARS." How garlic can be used as a remedy to flu has already been proven by Stanford Univeristy professors. SARS is speculated to be caused by Corona virus, which causes respiratory diseases such as flu. Dr. Hong explains that garlic in Kimchi could react against SARS virus in the same way as garlic does against flu virus. The spreading information of Kimchi's effectiveness in preventing SARS coincides with the dramatic increase in Kimchi products' sales in overseas market. The estimated value of exported Kimchi is 90 million dollars, compared with 79.31 million dollars last year. The largest overseas Kimchi market is Japan, which imported 28.53 million dollars of Kimchi products from South Korea, followed by the United States, Taiwan and Hong Kong. Even though Kimchi is receiving better recognition than ever before, a lot of foreigners are still reluctant to try Kimchi because of its stinging smell and taste. 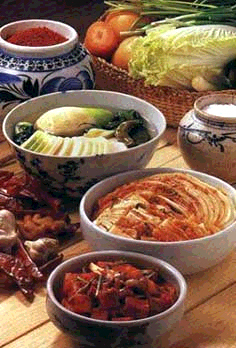 "To promote Kimchi in overseas market, the Kimchi producers should standardize Kimchi products. They should mark the degree of sourness of each Kimchi product," says Dr. Hong when asked how Kimchi could be better promoted.